If a tractor supply and a Walmart had a baby, this would be it. A jovial Phil Adair pushed a flatbed cart, containing feed and trash cans, up to the Rural King cash register just after 7 a.m. Monday to became the first customer at the new Ocala farm supply location. Well, they do sell remote control helicopters and drones in the toy section, right beside toy tractors, 12-volt Jeeps and other items for today’s child fascinated by farm equipment. Monday was the soft opening of the 85,000-square-foot Rural King, the 101st store for the Illinois-based company. The new store is at 2999 10th St., at the intersection of Northwest U.S. 27 and Northwest 27th Avenue. The “soft” opening drew about two dozen people to the store’s front door before it opened. Mia Gould, 36, arrived at 6 a.m. She operates a farm near Citra with her husband, Donald, 31. She was the first in line on Monday. Within 30 minutes of opening, about 100 people walked through the store, many looking around in bewilderment. The “soft” opening was designed to give employees some experience before the official grand opening weekend, which will be kicked off with a ribbon cutting ceremony on July 27. The store has all the typical farm supplies that most other retail stores do not carry. But it also has items that only can be found in pet, hardware store and Western stores. 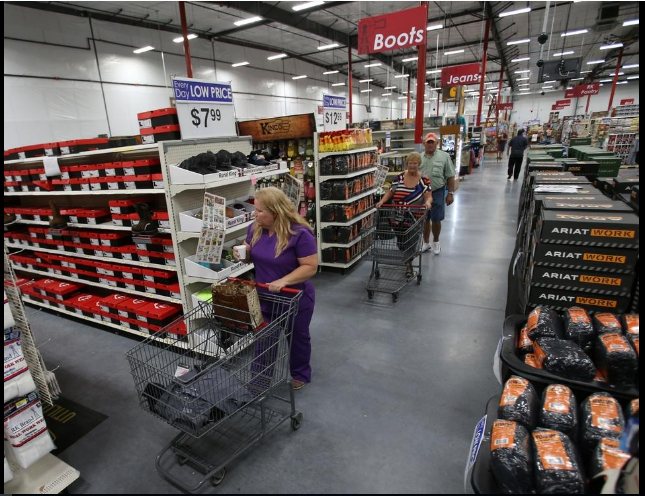 It also sells furniture, including camouflage couches; car batteries; guns and ammunition; boots, jeans and leather motorcycle jackets; pets; hardware and electrical supplies; gates; feeding systems; lawn tractors; grills; and much, much more. Brad Waddell, store manager, said the new Rural King is the eighth in Florida, all built since 2013. This one has 39 full-time and 51 part-time employees. Monday’s soft opening brought a mix of new curious Ocala customers and devoted shoppers who once had to travel to the Leesburg location. One shopper said that the Ocala store is the best yet. Curtis Lewis, an Ocala resident, waited patiently in the parking lot before Monday’s opening. He wanted to get his first glimpse of what Rural King had to offer. Lewis and another customer, Annie Morgan, wanted to compare prices with Lowe’s and Home Depot. “I also want to look at their guns,” Lewis said. Morgan was there to check out lawn equipment. One man, who did not give his name, was impressed that the store also sold jewelry — earrings, rings, necklaces and bracelets — from a glass case. Inside the case, large cowboy-style belt buckles were placed next to the jewelry.